Gold dragons make their homes in out-of-the-way places, where they can do as they please without arousing suspicion or fear. Most dwell near idyllic lakes and rivers, mist-shrouded islands, cave complexes hidden behind sparkling waterfalls, or ancient ruins. The dragon glimpses the future, so it has advantage on attack rolls, ability checks, and saving throws until initiative count 20 on the next round. 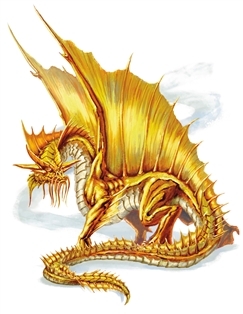 One creature the dragon can see within 120 feet of it must succeed on a DC 15 Charisma saving throw or be banished to a dream plane, a different plane of existence the dragon has imagined into being. To escape, the creature must use its action to make a Charisma check contested by the dragon’s. If the creature wins, it escapes the dream plane. Otherwise, the effect ends on initiative count 20 on the next round. When the effect ends, the creature reappears in the space it left or in the nearest unoccupied space if that one is occupied. Whenever a creature that can understand a language sleeps or enters a state of trance or reverie within 6 miles of the dragon’s lair, the dragon can establish telepathic contact with that creature and converse with it in its dreams. The creature remembers its conversation with the dragon upon waking. Banks of beautiful, opalescent mist manifest within 6 miles of the dragon’s lair. The mist doesn’t obscure anything. It assumes haunting forms when evil creatures are near the dragon or other non-evil creatures in the mist, warning such creatures of the danger. Gems and pearls within 1 mile of the dragon’s lair sparkle and gleam, shedding dim light in a 5-foot radius. If the dragon dies, these effects end immediately. Thinking about Gold Dragons? Definitely check out James Haeck's most excellent article on using them in your campaign - well worth the read!